Holiday house Stella lies approx. 40 km. south of Florence in the middle of the Valdarno Arentino hills at 600 m. altitude and offers her habitants a breath taking view at the Tuscan valleys. The complex has been restored in its original state preserving the authentic elements and is surrounded by vineyards, olive- and fruit orchards. 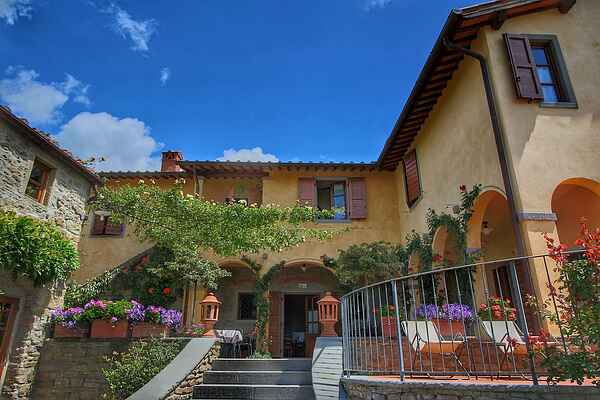 This Agriturismo is sub-divided in a number of holiday houses which is modern furnished in order to meet all the demands for a luxurious comfort. The Agriturismo lies on an estate of approximately 40 ha. of forest, which is a part of the nature reserve what shelters hares, squirrels, pheasants and other animal species you might encounter during your walks. You have a communal swimming pool at your disposal which offers a breath taking view at Pieve di Gropina. A recommendation for the romantic among us who love to experience a sunset from the swimming pool! Next to the complex there is an old little church which was used as a meeting point for the regional farmers in the old days. The Agriturismo also cultivates white- and red wine Chianti and olive oil. Due to the favourable location well known cities such as Florence, Arezzo and Siena are easy to reach.